Play Chrono Trigger online with Super Nintendo browser emulation for free! 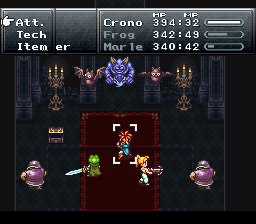 Chrono Trigger (SNES) game rom is loaded with features in our flash, java and rgr plugin emulators. Nothing to configure, we've done it for you! The millennium. A portal is opened. The chain of time is broken. A young man is transported into the past, altering the course of history and the outcome of the future. He has to find his way home, but first he must travel to the outer edges of time to repair the world's chronology. On the way he encounters strange friends and foes, utilizes incredible devices and vehicles, and penetrates and neutralizes the fortresses of the past, present, and future. A paradox has been created. If he does not restore the order of time, nothing will ever be the same. He is the one who will become a hero. He is Crono. 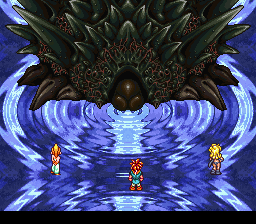 Chrono Trigger is a mind blowing addition to the Super Nintendo. I believe a lot of people were really pleased with this title and it is not very hard at all to see why. This game has amazing story elements and great game play. Never once did I find the controls awkward or weird and the game plays pretty straight forward for the most part so getting lost just wasn't an option. Needless to say that Chrono Trigger captured my heart and is still a very much enjoyed game today. Overall I rated this game a solid 10, I personally loved it and find it a cult classic of video games. 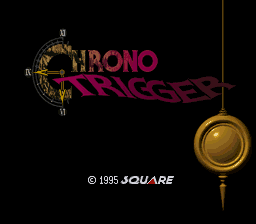 Chrono Trigger took me on an amazing adventure, and still takes me there time and time again. I never get tired of playing. I love the style and the feel of the game and the story, it is nice and solid. The graphics of this game look pretty good, especially for the era that it came out. I gave the graphics an 8, I loved them they were not to distorted that you couldn't tell what it was. You can definitely tell when you can interact with something and character designs look really nice. When it comes to the sound I had to rate it a 10, I loved every bit of music that this game produced each one fitting the mood of the level just perfectly. Each location sounding just as amazing as the first. Addictiveness I rated 10, I am completely hooked and love playing this game. I also think a lot of new age gamers, if given the chance, will love this game too. And I really think that the story is what captivates most people, so I rated it a 10 as well. Chrono lives with his mom and wakes up one morning to go to the Millennium Fair and see his friend Lucca, but then he runs into a girl who calls herself Marle. As you and Marle find your friend, you watch as she displays her new invention a teleporter which Marle is so happy and eager to test out. 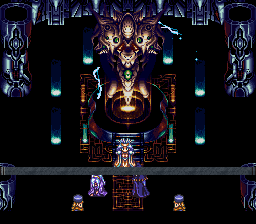 However, her pendant reacts to the machine and now Chrono must go to the past and save her, turning a simple rescue mission into saving the whole world from a destructive and desolate future. That is the story shortened up, I didn't want to give any spoilers. As for the depth I rated the game an 8. Sometimes you may find little secrets, like tonics and items. There are also a few extra characters who will aid you on your quest like Robo or Frog. Difficulty I rated a 7, the game wasn't hard really but sometimes can be a challenge when it comes to some bosses, etc. But overall the game is not impossible, not even slightly. 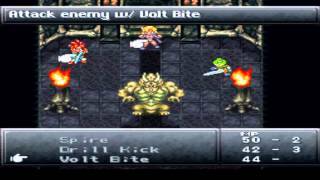 Chrono Trigger is needless to say an amazing game, and definitely deserves much praise. I hope that I have inspired those who have not tried this game to pick it up. It is an excellent adventure, and a wonderful game. Have fun, until next review. What begins as a carefree day at the Millennial Fair for a young man named Crono turns into his ultimate adventure. 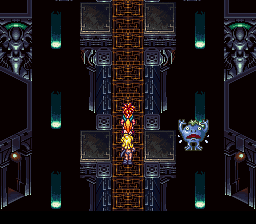 When Crono meets a young girl named Marle, little does he realize that this young girl, his best friend Lucca's invention, and a mysterious pendant will thrust him into the ultimate trip through time and space, encountering new friends, defeating the forces of evil, and encountering the one who would destroy the flow of time.rnrnChrono Trigger is a role-playing game, with the usual game mechanics fare for such: the player takes control of a variably large party, developing the combat skills of its members and managing their equipment. As the characters grow in power, not only their ability scores increase, but they also learn new "Techs" - special powerful attacks and maneuvers which cost them "Magic Points" to use in battle. rnrnThe game utilizes the ATB (active time battle) combat system from Final Fantasy games - sort of a mix of turn-based and real-time combat - adding to it combo attacks. Apart from normal Techs, it is possible to use Double and Triple Techniques - super-powerful attacks which involve two or three characters using their abilities at once. 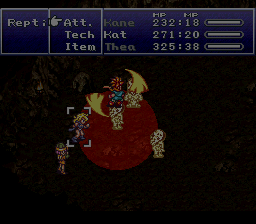 There are no random battles in the game, as all the enemies are visible on screen, and it's even possible to just pass by them entirely. rnrnThe game allows you to face your ultimate adversary at different points of time, which leads to several different endings. There is also a New Game+ option, which allows you to carry over your powerful characters to a new game, and adds even more endings to the already existing ones. This game is for all RPG lovers Lacedwithadaman.. Such a shame that certain parts of the game were censored in this translation of the game. I would say this game is a little overrated sometimes. 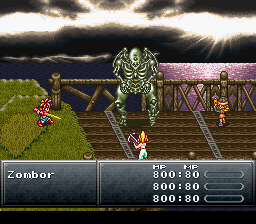 I don't enjoy it as much as Final Fantasy 5(my favorite JRPG), but this game is still great. 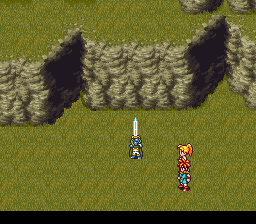 Have you ever notice that Crono looks a lot like Goku of dragon ball? Its because he is but just not the same name. Akira Toriyama creator of Dragon Ball was the character designer for the game. Look closely at the cover. I hope to have the game beat by Saturday. And have a review out by next Monday. About half way through the game and wow this is a incredible experience! One of the greatest RPGs ever made. Any fan of Final Fantasy, 'Tales of' Series or the like should enjoy this game very much. Nevermind, you have to be on the map to do so. A great RPG for the time it came out, and would enjoy seeing another game along the same series as this and Chrono Cross. I would love to play this game again, but every time I try I get a black screen. Anyone know how to fix that? supermegablox This game was amazing when it came out, it was pretty much the best rpg for its time. i kinda agree with dragon slayer, this game is so over rated. the storys kinda meh, its basically, oh theres a festival, oh you accidentally time traveled, oh look shes dead! save her! @dragonslayer444, excellent writing, excellent soundtrack, an unique battle system what with the double / triple techs, a great take on time travel, etcetera. It is a great game indeed, but you have your opinion. Can there be any more overrated RPG seriously what is the big deal with this game it is not that great. Pro Action Remix works too.